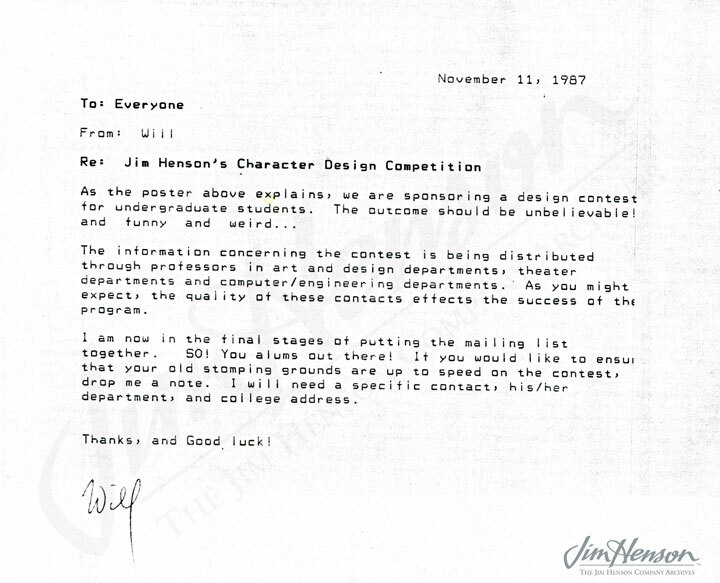 In September of 1987, Henson Associates (to adopt the banner Jim Henson Productions one year later) used the notion of the dynamic duo as the theme for a character design contest for university students. 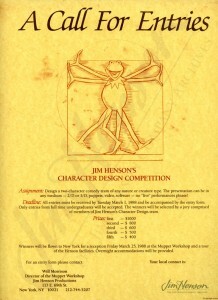 Spearheaded by Will Morrison, director of the Muppet Workshop, with Michael and Jim, Henson Associates sent contest announcements to universities inviting students in the fields of art, design, theater, and computer technology to design two-puppet teams. They could utilize any material they wanted, and the puppets could be 2D or 3D. 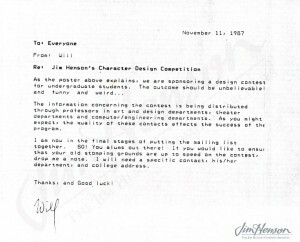 The goal of the competition, according to Will’s memo to the company, was to “encourage creativity and bring [Jim] into contact with new talented designers.” The top five contestants won a trip to New York City for a character design workshop with the Henson Muppet makers, which the company decided would be a much more unique prize than a cash award. This was also a chance for the creative team at Henson Associates to get to know new and emerging talent in the field of puppetry. The contest ran for three years, with winners announced in the spring of 1988, 1989, and 1990. The top winners from each year are listed below. Memo from Will Morrison to Company, November 11, 1987. 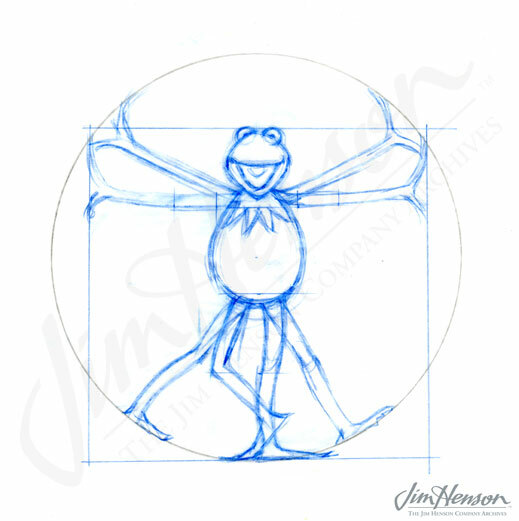 Michael Frith’s sketch of “Vitruvian Kermit” for design contest poster, 1987. Poster Announcement for Design Competition, 1987. 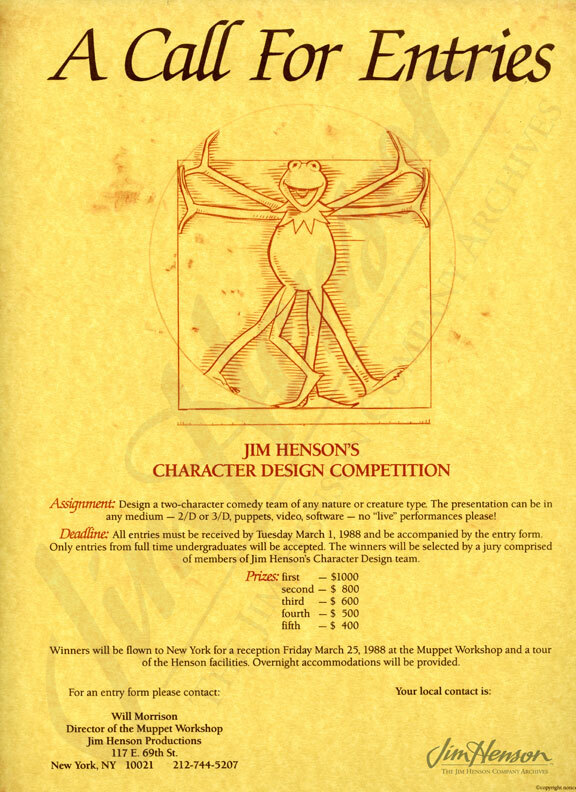 This entry was posted in 03-March '88, 1988 and tagged contest, design, Henson Associates, Muppets, puppets. Bookmark the permalink.